A temporary work assignment that required a great deal of walking led to plantar fasciitis in my right heel and foot. My personal experience with heel pain arose shortly after I got a temporary work assignment. I was happy to have a job, but it was one that required a great deal of walking in the office, helping people from one end of the building to another. It was at this time that I started experiencing a terrible sharp pain in my right foot that made it difficult to walk around the building. I researched the many ways to treat this pain, and I have outlined these options in this article. I will also outline the quick, easy, and free ways I now use to avoid a recurrence of this type of heel pain. What is Plantar Fasciitis and How Do You Treat It? If your foot hurts when you try to walk on it, especially when you wake up in the morning, you may have plantar fasciitis. The heel hurts as it stretches to accommodate your weight. The plantar fascia is the thick band of tissue, or ligament, on the bottom of your foot that connects your heel to your toes. It is what creates the arch of your foot. If you overstretch or overuse this tissue, you may get an inflammation called plantar fasciitis. It is a very common condition, and it can strike both men and women. With the foot pain, you may start limping or walking differently to compensate, which will cause pain in other parts of the body—especially the knees, the hip joints, the back, and the muscles in the legs. Other people try to limit activity, which can also cause problems. There are ways you can treat this condition, both at home and at a doctor's office. Many methods of treatment are discussed in this article. If you experience sudden weight gain. It takes a long time for your foot to heal; it can take anywhere from two months to two years. Fortunately though, there are many things you can do at home not only to relieve the pain and inflammation, but also to avoid further issues. You can try one or a combination of these methods to see which ones work best for your particular situation. You can reduce the swelling by applying ice to your foot. The easiest way to do this is to take a can from the pantry and freeze it. You can then easily roll your foot on top of the can to ice it. I recommend taking the label off the can first, since the condensation will remove the label and it will pick up the dirt and fur from the carpet. You can also use a frozen water bottle. The can and the water bottle will help reduce the swelling, and as you roll your foot back and forth over it, you exercise your foot at the same time. Pain relievers with acetaminophen, such as Tylenol, or with ibuprofen, such as Advil or Motrin, can help to temporarily reduce the inflammation and pain. You can use a frozen can or water bottle to ice and exercise your foot, as discussed previously. You can also roll your foot over a tennis ball. There are a variety of additional stretching exercises you can do to help increase the strength and mobility of the connecting tissue in your foot. Since you want to stretch the bottom of the foot, instead of pointing your toes out like a ballerina, you want to point them upwards towards your leg to flex your foot. In addition to stretching your foot, you also want to stretch and strengthen all of the muscles on the back of your legs, so that they do their share of the work. If you know that your plantar fasciitis was caused by something in particular, you will want take better care of your feet by stopping that action. This may mean that you will have to cut down on your high impact sports activities that require a lot of jumping. You can sit down whenever you get a chance to avoid long periods of standing. Don't exercise or walk barefoot on hard surfaces. If you do repetitive impact activities such as jogging, you may want to limit it to every other day and rest or cross train to give your feet a chance to rest. 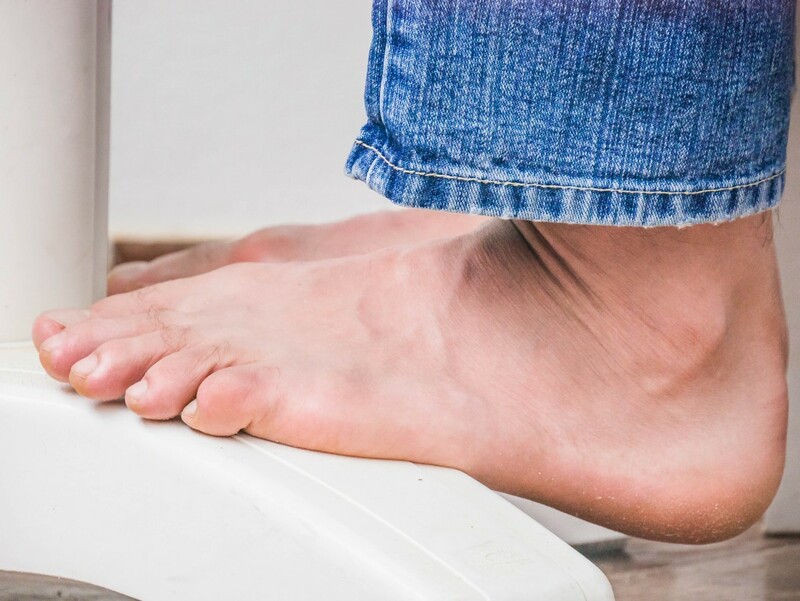 If you are overweight or obese, you will want to reduce your weight to reduce the load on your feet. You can buy heel cup inserts for your shoes that will cushion and provide support for your heel. If you have high arches or flat feet, inserts that help support the arch as well is recommended. Even if you only have plantar fasciitis in one foot, I recommend getting and using the inserts for both feet. These inserts will not only help relieve the pain, but will also help avoid or reduce future problems with your feet. To try them out, you can just get one pair and move them when you change shoes. Once you realize how helpful they are, you may want to purchase several pairs so you can leave them in several pairs of shoes. Besides the ones that can be purchased over the counter, your podiatrist will also be able to provide prescription orthopedics that you can insert in your shoes. In order to avoid stressing out your feet in the future, it is important that you wear shoes that provide ample support for your foot, particularly the heel and the arch. This means you can no longer walk around barefoot, or wear flip flops and ballerina slippers. At a minimum, you want to wear shoes that cannot easily be folded in half. 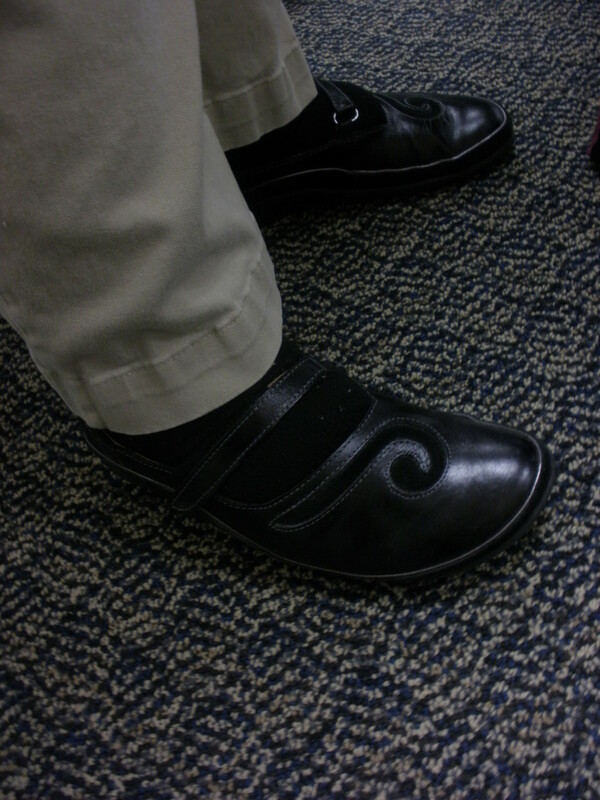 For dress shoes, my coworker recommended the Naot shoes pictured on the right. These shoes have a "removable, anatomically correct natural latex and cork footbed coated in suede and contoured to adapt to the shape of your feet," according to the advertising on Zappos. While these shoes are about $150-$180, they last a long time and can help avoid future medical expenses. Alternating between at least two pairs of shoes is recommended to allow your shoes a chance to rest and allow the cushioning to go back to its original position. You should also replace worn out shoes that no longer provide support. If these home remedies do not work for you, it is time to see a professional. Although I haven't tried it, I did have a friend who said that acupuncture is helpful to treat the condition. 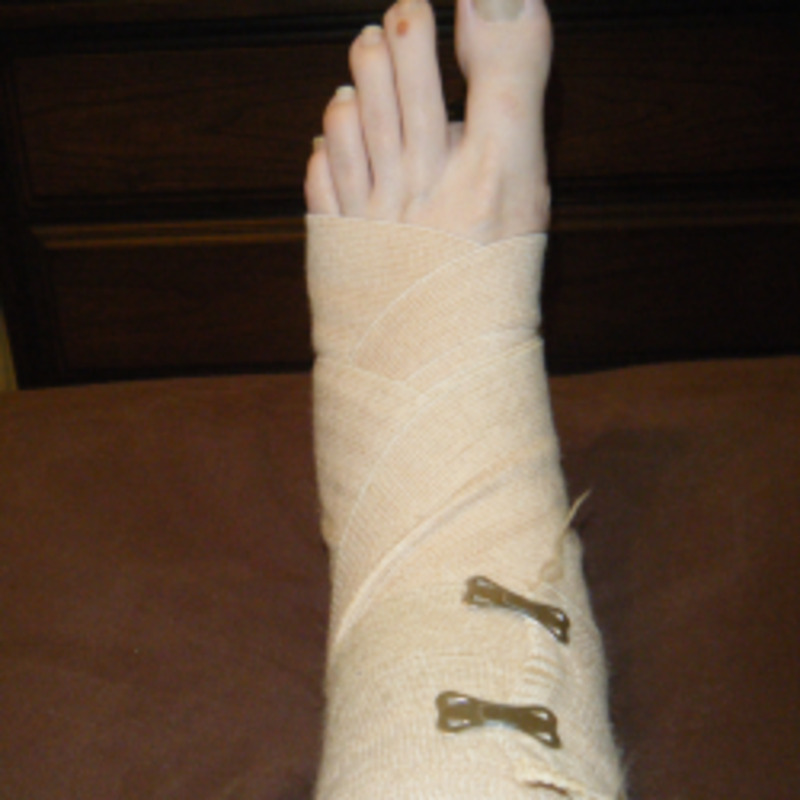 Many of my friends recommended a cortisone injection to treat plantar fasciitis. The doctor will apply some freeze gel before injecting the cortisone in the heel of your foot. It does burn as it goes in, but it does relieve the pain pretty quickly. 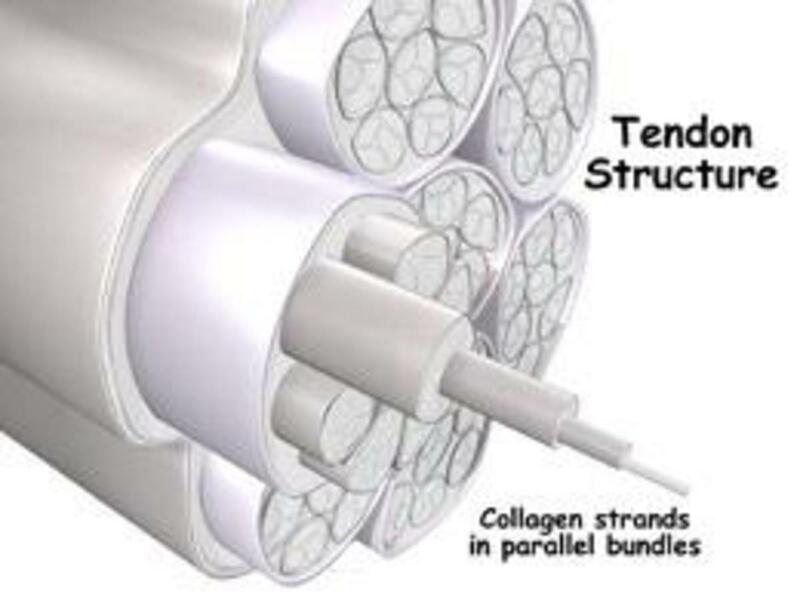 While some people found instant relief with this treatment, I found that it reduced my pain significantly, more than 50%, but I continued to experience some pain afterwards. Please note that cortisone injections can have serious side effects. Please discuss these with the doctor before getting a shot. 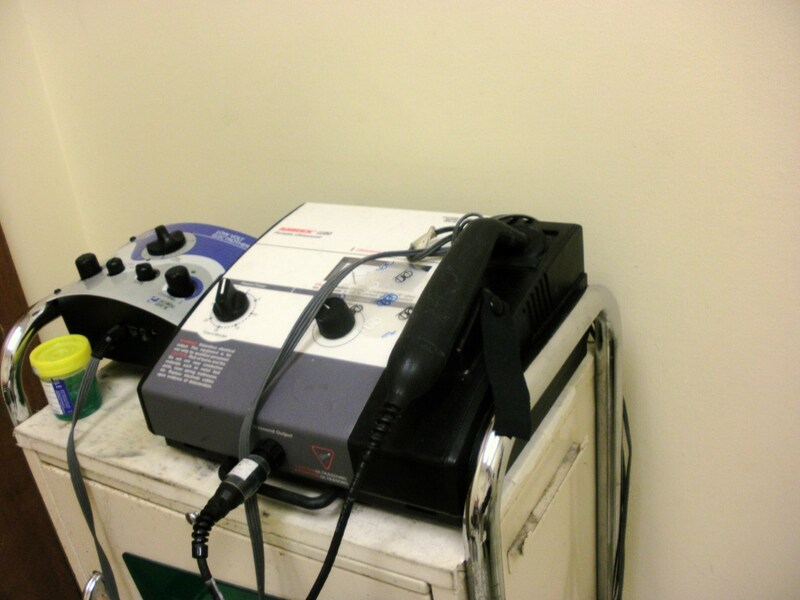 While I was at the podiatrist for the cortisone injection, she also recommended some physical therapy that included ultrasound therapy, deep tissue massage, and electro stimulation (electrostim) therapy. 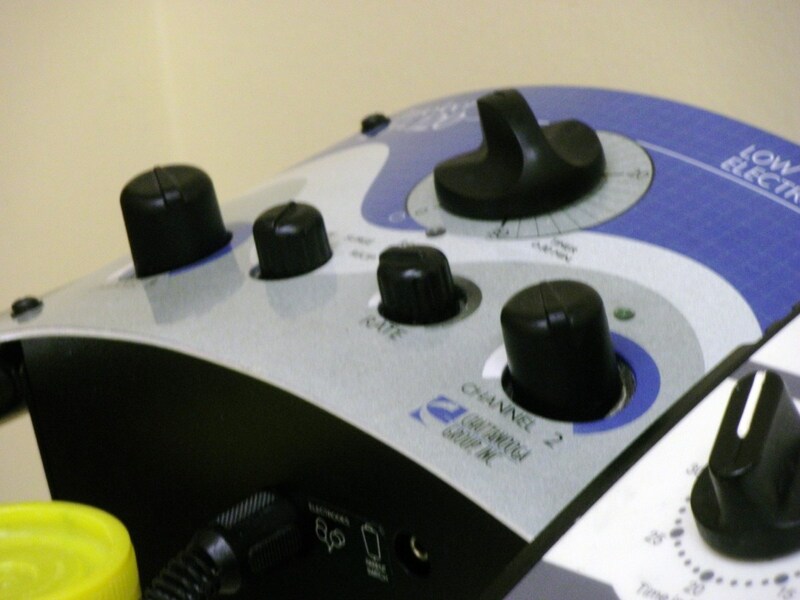 With electro stimulation therapy, pads are attached to the foot, and the machine is turned on to a desired level. This therapy emits low level electrical impulses on your foot to increase the blood flow and strengthen muscles by contracting the soft tissues. Different studies on this therapy are producing different results. Some say that this therapy works, while others say it has no effect. The podiatrist recommended shoes that provide proper support, ice, and pain relievers, as we have discussed earlier. Another thing she recommended was a night splint. Most people sleep with their plantar fascia flexed, which shortens in. 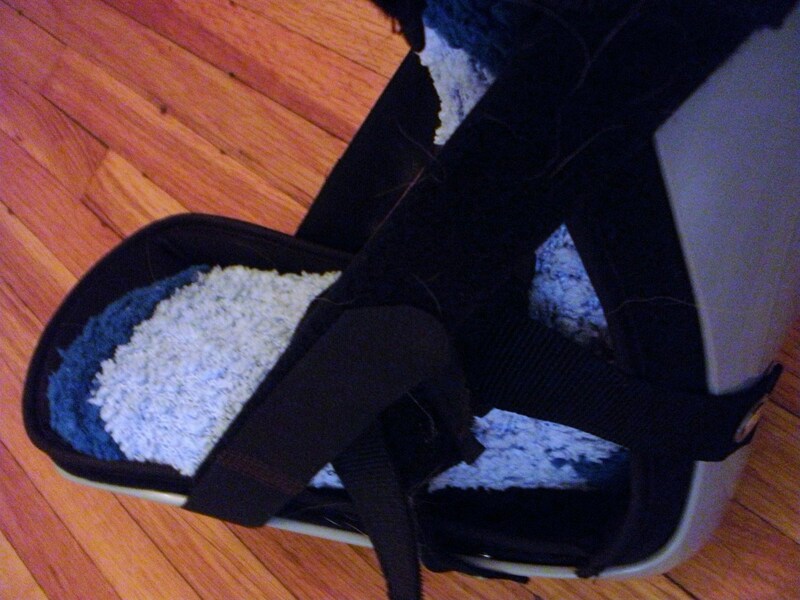 The splint works on keeping your foot at a neutral 90-degree angle, and passively stretches the tendons and ligaments. This also helps avoid that sharp pain and re-injury in the morning. You can't walk around in it or put your weight on it, but she recommended that I wear it at least an hour a day or even overnight until I was completely healed, and to use it again if I started having foot pain issues again. Most cases of plantar fasciitis can be remedied with the treatments we have discussed thus far. 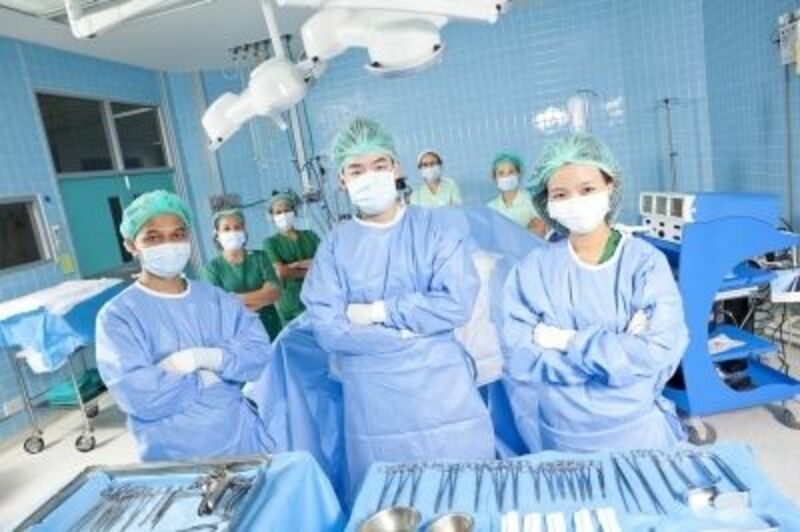 There are a few cases that require surgery. Instead of taking our feet for granted, we can avoid injuring our feet again by watching our actions and wearing supportive foot gear. As I said, I went to the podiatrist and received treatment. Since a podiatrist is a specialist, I had to pay a higher co-payment for each visit. This can get very expensive, but it did allow me to continue working the remaining part of my temporary assignment. Since then, I haven't had as much pain. Most of the time, I do not feel any pain at all. To avoid this type of thing from happening, I make sure I use supportive shoes. Not the expensive kind that is made especially for plantar fasciitis, but the regular kind that is on the sales rack. I simply make sure that the shoe cannot fold in half. So I could keep wearing my older shoes that can fold in half, I used some shoe inserts to provide the support my foot needs. These inserts can be purchased on sale, and you can move them from one pair of shoes to another without having to buy a pair of inserts for each pair of shoes. Sometimes, there is a short-term pain to remind myself to treat my foot carefully. When that happens, I simply go back to the stretching exercises my doctor taught me, and that is usually enough to make my heel is fine again. When the pain happens in the morning, I am able to do the exercises before I get out of bed and I am fine for the day. When the pain happens in the evening, besides the exercises, I also roll my foot on a can of something frozen, and that also reduces the inflammation and provides relief so I can sleep. How often do you get Plantar Fasciitis? I had it once or twice. I suffer from it all the time. Is foot massaging nightly helpful for Plantar Fasciitis? Yes, it does help me. 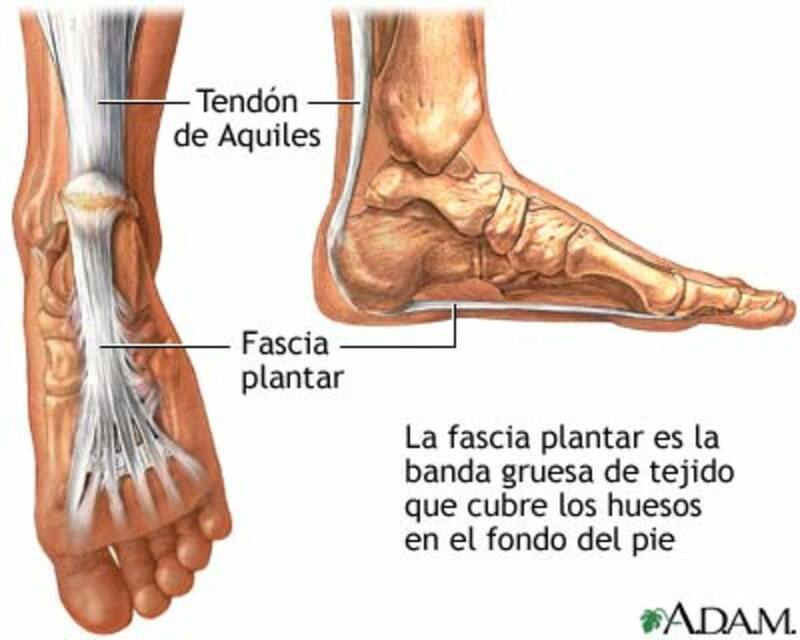 Comments: "Treatment for Plantar Fasciitis Foot Pain"
Thanks for your visit and comment Marian. I do hope the podiatrist is able to help you with your heel pain. Great article. Very informative and well written. Lots of good ideas. I had/have plantar fasciitis and had Ultrasound treatment on one foot. I had been doing a lot of walking outdoors on hard surfaces, while walking my dog for 30 minutes to an hour and a half a day, depending on the weather. I also have high arches. I have a splint that I used when I experienced pain. I can't wear shoes that have a back so wear clogs and slides. I'm going to see a podiatrist soon about the heel pain. I have a lot of shoes that I would like to be able to wear again with arch inserts. Again, great article. Thanks GTF - it does take a long time for the feet to heal. I'm not a doctor so I don't know which exercises will heal, but there are a number of them on YouTube. I liked these the best of the ones I looked at. They are pretty easy to do and they seem to be helping. Useful hub Millionaire. I've had this a couple of times and it is not fun at all. It also seems to take forever to heal. I love the stretching exercises. Thanks Kathy, I am glad that your Plantar Fasciitis has gone away. That is hopeful news for some people. Thanks Ruchira, they come up with a fancy name for everything, don't they? I am glad to know that it is a condition that can go away eventually if you treat your feet correctly. Thanks Deborah-Diane for the comment and recommendation. I have to go shoe shopping soon, so it is helpful to have other options. 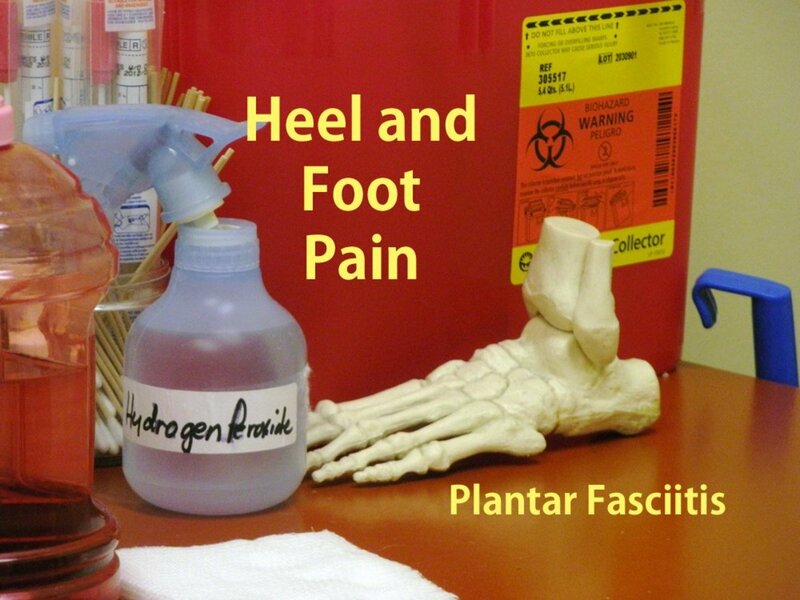 Thanks Dianna, plantar fasciitis and heel spurs are somewhat related so I would think that all of these things would work for both. Thanks so much Effer, you are so sweet. I am glad you haven't had this condition. Thank you for telling us about your friend. Thanks Timetraveler2. I am glad that you are able to avoid the pain by doing the exercises and wearing the inserts. Thanks for the tip about cutting the insert to make it more comfortable. Thanks Austinstar for your input and comment. I am sorry that you have to deal with not only the plantar fasciitis, but also the gout. I hope that some of these tips help the pain go away. I have stiffness from a spur on my heel and I think this could possibly help. I do have to wear comfortable shoes to help cushion my heel. The video was really useful and I can see where these exercises would also help with stiffness. Thank you for posting this information, I am going to use this at home. Very useful information. I have discovered that Easy Spirit shoes have helped me a lot, and I can also wear Rainbow flip-flops with double arches. Other than that, most shoes are uncomfortable. Wow, excellent hub. I suffered from Plantar Fasciitis a few years ago, and it was awful. I wish I had read this article back then - it would have saved me some time and some pain! Great job on this one Shasta - it's so comprehensive. You've written an excellent resource! Truly painful condition. I also suffer from gout and if that is not enough, the fasciitis acts up! Some days it doesn't pay to get out of bed. I developed this painful condition in both feet a few years ago. I began a regular regimen of stretching, massage and calf and foot exercises and also went to Walmart and bought some double foam shoe inserts. I cut a hole in each insert in the exact area where the lump appears on the bottom of my foot, so that this area does not bear the weight of my body. As long as I follow these practices, I have no pain! M.T. Have never had this painful condition, but do know several people who have dealt with it. In fact, a really good friend of mine sees a podiatrist regularly and has had the rare surgery....poor woman. She's very careful about her footwear, I can assure you of that.